Haven’t had the chance to leave your Residence Hall because you’ve been studying around the clock for Finals week? Are you running low on dining points but still want to have a tasty meal? Well here’s a quick and easy recipe you can make for you and your friends – no cooking experience required. Heat thoroughly thawed and drained spinach over medium heat until spinach is dry. Sprinkle shredded cheeses (cheddar cheese and parmesan) over bottom of pie crust. Add spinach on top of shredded cheeses. . Beat all four (4) eggs in a bowl and with ½ cup of ricotta cheese. 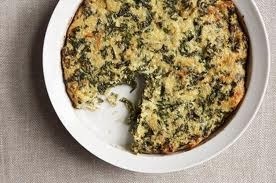 Pour egg mixture over spinach and shredded cheeses. Bake at 375o for 50 minutes or until brown. Note: you can also add ½ cup of chopped bacon or ham to this dish for added flavor.